About: Erin Chase is the wonderful woman behind MyFreezEasy. 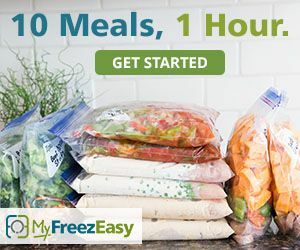 She put together MyFreezEasy.com Freezer Meal Plan Membership to help make things easier in the kitchen at dinner time. Being a mom of 5 and a busy schedual I was happy to review this. MyFreezEasy allows you to make a meal plan for your family. You can choose from pre-designed meal plans for complete ease or you can do custom meal plans from their huge list of recipies. I went with the pre-designed meal plans just because I didn't want to take the time to filter through so many tasty meals to make my own plan. The plans include 5 to 10 recipes thst can make 10 to 20 meals. The plans are super easy to read and understand. They include the recipe for the meal and how to serve or how to freeze for later. Also included is the shopping list, assembly instructions, and lables for if you freeze the meal. A bonus is that the recipes also come with modifications to make them gluten or dairy free. I have one dairy free kid so it was nice to be able to easily change a recipe for her. There are also many different plan options to choose from. So if you have found a sale, on say chicken you can check out all the chicken meals to use it up. There is also the gluten free plan which I know many people would love. I also loved that it is all laid out for you on how to prep to cook. This was also an added bonus to be easy for my daughters to help cook as well. Having everything there step by step they were able to make some of the meals themselves. Unfortunately Hurricane Matthew wiped out all of our meals as we lost power and still have not gotten it back on. I will be glad to get back into stocking up again though. Our favorite meals were the chicken recipes. We made the Baked Island Chicken last. It was a nice sweet chicken which the kids love anything sweet. That is another thing I loved is I found most all recipes were very kid friendly. Also letting your kid help you assemble the meals makes them more likely to try the fruits of their labor than if you just blindly give them a new food. Overall great membership to have. Great for busy mom's and dad's as well as maybe a new chef in the house wanting to try to make new foods and can help fill the freezer while doing so. I also believe this is grest for those families who may not be bus but don't have the ideas on what to cook. This really takes the guess work out of it all. Be sure to check them out on Social media as well as see what my fellow crew mates cooked up.